ROEBIC Grease Trap Treatment is a bacterial product designed to degrade fats, oils, and grease (FOG) in food service and processing wastewater systems. Our liquid formulation contains stable Bacillus spores, including six of our patented ROETECH strains, as well as a biodegradable surfactant and odor neutralizing fragrance. Used regularly, it will reduce and control FOG levels and odors, thereby avoiding costly clogs, backups and overflows. 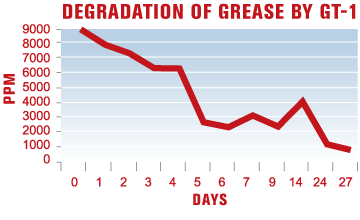 Results of a controlled laboratory study show how efficient Grease Trap Treatment really is. FOG was reduced from 8220 parts per million to 130 parts per million over a 27 day period: a 98% reduction. Results are the average of triplicate samples and were determined by the standard hexane extraction method by a certified laboratory. This impressive grease degrading ability of Grease Trap Treatment translates to the field results as seen to the right.